Columbia-Greene Community College, a campus of the State University of New York, has been named one of the best community colleges in the country for the second year in a row. 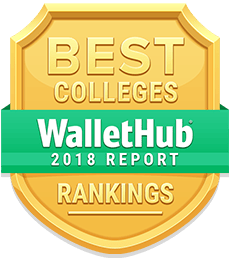 According to a list compiled by WalletHub,a personal finance research, surveying, and review body, C-GCC ranked second in the state and 24th in the nation out of 715 community colleges. In turn, New York State ranks fifth on the 2018 list of the Best Community College Systems in the Nation, (behind South Dakota, Minnesota, Montana, and Arkansas). C-GCC President James R. Campion said the results of the WalletHub report are both encouraging and proof of a long-standing mission to provide the programs and services most needed by the surrounding communities. Data used to create this ranking were collected from the National Center for Education Statistics, Council for Community and Economic Research, and College Measures, and analyzedusing 17 different metrics ranging from the cost of in-state tuition and fees to retention rates and to career outcomes. The report also underscored the overall affordability of a community-college education. A comprehensive two-year college offering a variety of transfer and career programs leading to associate degrees in Arts, Science, Applied Science, and Occupational Studies, C-GCC also offers one-year certificate programs and both credit- and non-credit courses geared toward community interest. Approximately 80 percent of entering students receive some form of financial aid, and those who transfer from C-GCC to a four-year college save up to 40 percent on the overall cost-per-year of their education.